Which Nvidia AGP card to choose for your retro system? Most people into retro computing have to make decissions for their hobby. What era, how many systems, what will I spend on it and will my wife appreciate it as much as I do. For those on a tight budget or limited space it is important to make the right choices. This article tries to help you make a founded choice as it comes to 3D graphic cards. If you don't play games on your system, most AGP cards will be fine for you. But if you do play games, especially on Windows 95/98 or ME, you will want a card with a little extra. Speed that is. Or better graphics. If you use a system with Windows XP I recommend a PCI-e graphics card and this article is not meant for you. PCI-e cards are newer most of the time and will last longer. Old electronica tends to rot over time. For the record: I've benchmarked on XP and not a Windows 9x system. The system I used is perfectly capable of running it, but installing and de-installing drivers all the time on a Windows 9x system tends to make the system unstable. And reinstalling the OS is a bit too time consuming for me. While there will be differences in speed, most of the time the relative speed will remain the same. The results in XP will give you an indication of what to expect. I took a fairly common piece of computer history. A solid socket A/462 motherboard. They still are easy to get at a fair price. And Windows 9x drivers will not be a problem for most. If you go after one, please take a good look at the capacitors. The tend to bulge from age. If they do, don't use the board. If you know how to handle a solder iron, you can try to replace them. A good A brand is also something to look for. Gigabyte or Asus for example. Asrock wasn't that good back in the days. They are known for using lesser capacitors. 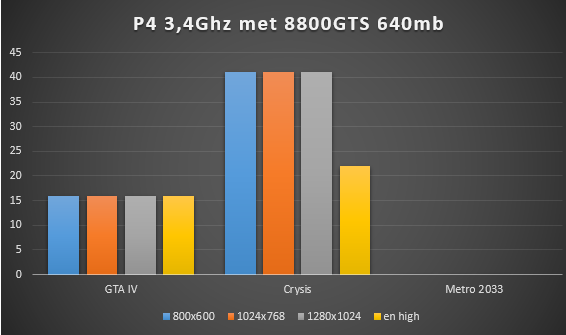 I have benchmarked the following cards. They appear in order of the year they were introduced. Back in the days it wasn't logical to benchmark a card in the 6600 range against a Geforce 3. They are completely different generations. But with in mind what I stated before, money, space or otherwise, it can be good to know how they stride against each other. 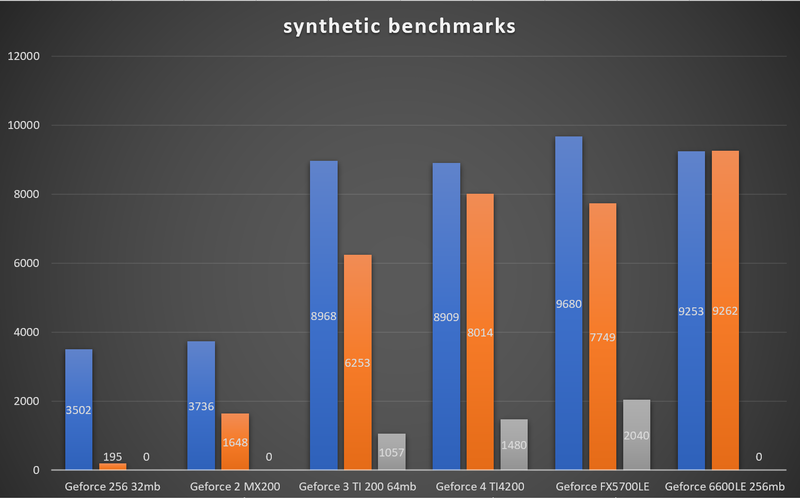 First the synthetic benchmarks. I used 3 of them. The 256 and the MX200 could not use 3DMark '03 to the fullest, so I have set the results on zero. Same counts for the 6600, but for a completely different reason. As soon as I start the benchmark it crashes. So something to keep in mind. The Geforce 256 clearly is the looser here. The much cheaper and wider available 2 MX200 surpasses it. The TI4200 is holding up nicely against the newer 5700 and 6600 LE versions. No bad scores for the 3 TI 200 too. Then the first real game. I took Unreal Gold and set it at DirectX rendering. A few surprises here. The Geforce 256 would not start the game at all. 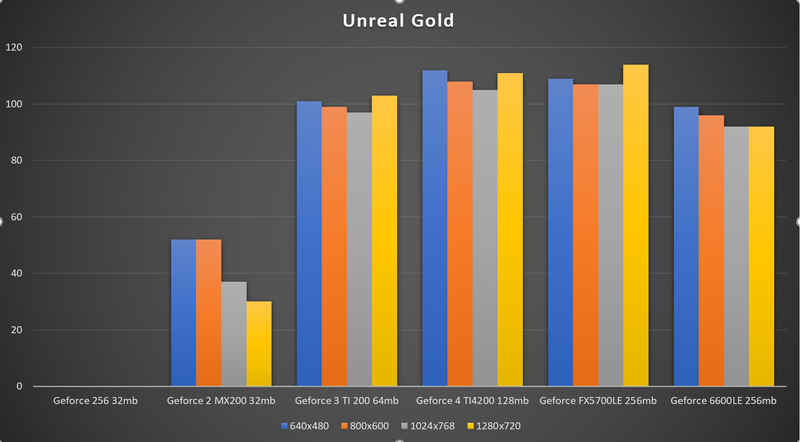 The MX200 deliveres barely playable framerates. And some cards produce higher framerates at the highest resolution. The big surprise to me is the TI4200. The 6600LE is underwhelming. 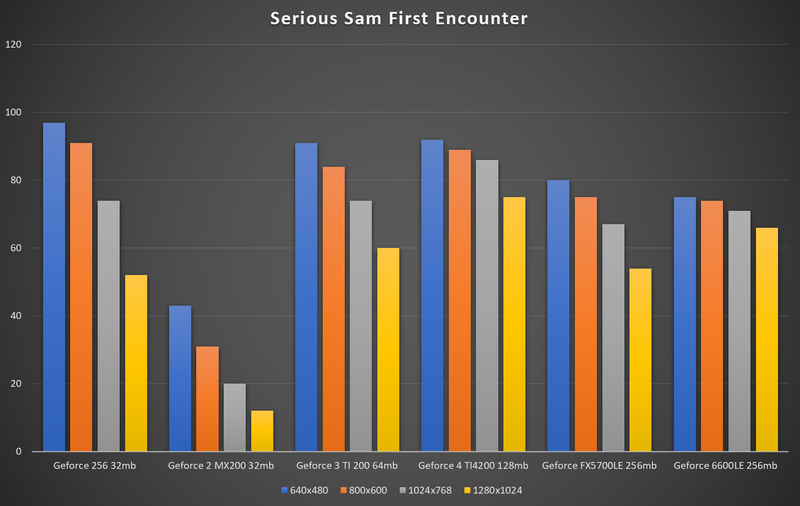 Now for Serious Sam First Encounter for the OpenGL benchmarks. I've used the Karnak level to benchmark. A few surprises overhere. Except for the 2 MX 200 all other cards produce playable framerates. Even the Geforce256 which even wins on the lower resolutions. It must be optimized for OpenGL somehow. The other surprise is that the 5700 and 6600 fall behind the 4200. But.....the 4200 produced an unplayable picture. Lots of screen tearing and other weird things going on. I have not looked into that. Maybe a simple patch good resolve it. I don't know. The Geforce 3 is my personal favorite. It ran everything. Not the fastest card, but reliable. The 5700 would be my second best card. It scored highes in the synthetics, but I'd rather play games.